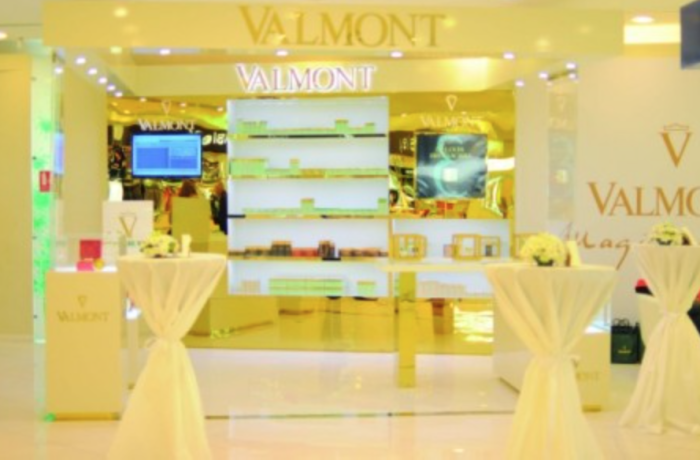 There is a luxury anti-aging beauty brand called Valmont, a Swiss beauty brand founded in 1905 by a medical doctor. It started as a clinic offering spa treatments and was frequented by the celebrities and actors of the day such as Coco Chanel, Charlie Caplin, Ingrid Bergman, and Grace Kelly. Today, Valmont combats anti-aging in skincare, haircare and body, boasting of an ingredient called Triple DNA derived from a specific type of salmon from British Columbia that infuses the products with cellular regenerative properties. For more than 25 years, the Valmont Group has been helping women and men master the visible signs of aging. Heir to traditional Swiss medicine, the company draws from the unspoiled natural resources of Switzerland and the latest cellular cosmetic research findings to formulate utmost anti-aging skin care products featuring visible and long-lasting efficacy. The group has surrounded itself with the best experts to create extraordinary product ranges, all subtly combining refinement and anti-age efficacy... to enhance the beauty of women and men. The history of the Valmont Group is closely tied to Switzerland and the Valmont Clinic (the first in the country to be fully dedicated to health and wellness)... and to seeking absolute efficacy in the struggle against the signs of time. Built in 1905 in an exceptional and intimate environment above Montreux and Lake Geneva, the Valmont Clinic was the first to offer dietary follow-up and hydrotherapy sessions. In the 1980’s. Valmont innovated by becoming the first Swiss clinic entirely dedicated to plastic surgery. While continuing to cater to prestigious guests, the management began entertaining the concept of offering an exclusive range of skin care products capable of prolonging the benefits of plastic surgery. Building on their clinical expertise, distinguished cosmetologists selected the most active molecules for skin regeneration – such as HP DNA and native collagen, marking the birth of Valmont cellular cosmetics. This concept met with immediate success. The history of Valmont became quickly tied to the destiny of Didier Guillon (current President of the Valmont Group). Guillon became sole owner in 1996 and was joined by his wife Sophie Vann-Guillon in 2000. Today. Although the clinic and cosmetics are now two clearly separate entities, Valmont perpetuates the Swiss medical tradition, driven by Didier Guillon and Sophie Vann-Guillon (General Director of Operations). Both share the same vision of cosmetics and beauty, and the same desire to innovate and achieve excellence in skin care product quality. In charge of product development, Sophie Guillon is also the Valmont ambassador with key opinion leaders from Paris to Hong Kong via New York. Didier Guillon, who is a great amateur of American minimalist art, handles the international expansion of the business along with the artistic direction (visual identity, packaging, website, concept and environment of the Spas by Valmont...). Working by their side, close to 200 employees contribute to the reputation of excellence and efficacy of the Valmont skin care products in around 2,200 points of sale and spas present in 43 markets. In California, Valmont is sold at Saks Fifth Avenue in Beverly Hills and at celebrity facialist, Yonat Zilberg in Sherman Oaks. In its formulas, the Group selected and fine-tuned active ingredients and molecules that are highly beneficial to the skin: Glacial Spring water, Primitive collagen extracted from the medusa, HP (highly polymerized) DNA, Triple DNA, RNA and DNA liposomes. Valmont developed Triple DNA and DNA liposomes and is the sole owner of the production process for RNA. By combining these molecules, Valmont has reached unprecedented anti-age efficacy. It’s in the heart of Swiss natural resources that Valmont discovered water with unique properties: Glacial Spring Water. Drawn at an altitude of more than 2,000 meters in a privileged environment at the foot of the Valais glaciers, it enters the composition of Valmont skin care just as Nature created it: pure, soft and perfectly balanced. Thanks to its ideal composition in minerals, it encourages tissue exchanges, revitalizes the cellular metabolism and stimulates the skin’s natural defense system. DNA is a highly functional key molecule. It controls, in the heart of cells, the synthesis of the body’s proteins. In cosmetology, the secret of DNA lies in its structure. Its original structure, as a double helix, provides DNA with exceptional moisturizing, anti-oxidant and energizing properties as well as amazing capabilities of cellular regeneration. The DNA that is used by Valmont comes from the Canadian salmon soft roe. Thanks to a patented extraction process, its molecular structure remains intact. The DNA is said to be “HP” which means highly polymerized. When ingenuously combined with three essential macro- elements (Magnesium, Calcium and Sodium) HP DNA becomes Triple DNA. Selected for their oxygenation and cellular regeneration properties, these three macro-elements provide the DNA molecule with the benefits of the mineral world. RNA is an intermediate molecule which is abundant in cells and contributes to the process of protein synthesis. Incorporated in the heart of Valmont formulas, RNA releases a genuine source of energy and acts as a powerful bio-activator of cells. In 2010, Prime Generation line formulas integrate a new kind of RNA: RNA in liposome which has the property to rebalance the intercellular cement. now the turn of DNA to benefit from this means of delivery. The creation of the DNA liposome is a true tribute to scientific research. The result of long collaboration between R&D and the know-how of partner laboratories, this innovation is a real technological prowess as it is extremely difficult to encapsulate Triple DNA (because of its high molecular weight and polarity) into a membrane of phospholipids. With this new exclusive ingredient, Valmont is reaching new levels of anti-age efficacy and technology. At the heart of the Swiss Alps in the village of Vens, Valmont established a unique Phyto-Alpine garden. Halfway between landscaping, art and science, this pure and privileged setting is where Valmont cultivates plants selected for their effects on the skin, thus ensuring total quality control of the extracts that will be incorporated into the products. To implement this concept of Phyto-Alpine Garden, Valmont called upon leading Swiss experts. Selecting the plant species (MEDIPLANT), cultivating (VALPLANTES) and producing the plant extracts (ALPAFLOR)... All of these stages were carried out in collaboration with Swiss partners that share the same philosophy and passion as Valmont. And for Valmont, excellence in extraction is extremely far reaching. Whereas others use the entire plant during extraction, Valmont only selects the part that will allow the purest extraction. Moreover, the extraction of the essential molecules is carried out with extreme care, thanks to resorting to Propylene Glycol or supercritical CO2 instead of hexane. This is how PURE EXTRACTS are born from plants.